Wall cross of solid metal with bright finish features sentiment inscribed with detailed border and scroll accents. 5.5" tall with knotch on back for hanging; gift boxed. 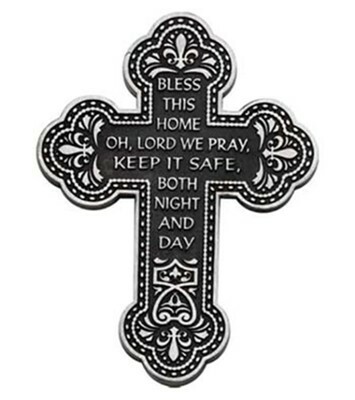 Bless this home oh, Lord we pray, keep it safe, both night and day. I'm the author/artist and I want to review Bless This Home Wall Cross.